iRecruit’s user dashboard is the default screen when a user (Administrator, Recruiter or Hiring Manager) logs in. This page is highly configurable. Each user can select the elements or widgets that display on their dashboard, therefore allowing them to prioritize what information they see when they log in to their accounts. You can even customize the color scheme. Applicants by Status: Status is the workflow in your account that shows which stage each candidate is in during your recruitment process. Applicants by Disposition: Disposition is a sub-group of the applicant status to report on reasons why candidate(s) were not selected. Appointment Calendar: This will show any reminders you have created, plus any scheduled appointments with candidates. 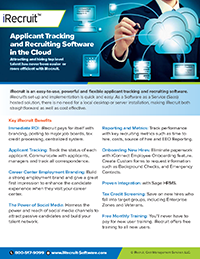 Additionally, the iRecruit calendar will notify you of any upcoming training sessions and software updates. The Reminders Widget: This handy widget allows you to add reminders or to-dos to your appointment calendar. The Custom Links Widget: This widget lets you add an unlimited number of custom links to other websites or services that you use. The Quick Applicant Search Widget: Quickly look up candidates by name, or ID number to quickly find their application. This also displays the 10 newest applications. The Recent Applicants Widget: This shows the five most recent applications. The Applicant Count By Referral Source Widget: This automatically counts the number of applicants by how they heard about your job opening. This is also available in a detailed report format. The Requisition (Job Opening) Search Widget: Quickly look up your job openings by title or keyword, showing active or inactive. This also displays the 10 newest job openings. Additionally, users have the option of seeing the iRecruit news widget, help file, and how to contact iRecruit Support. This entry was posted in Blog, iRecruit Blog and tagged applicant tracking software, dashboard, iRecruit. Bookmark the permalink.